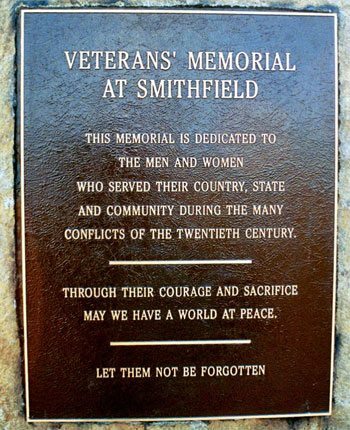 In November 2001, hundreds flocked to Deerfield Park in Smithfield for the dedication of the Smithfield Veterans Memorial. The original event was held two months after the September 11th terrorist attacks. The monument was designed to honor all veterans from every branch of the armed services who have served in every U.S. armed conflict from the 20th century on. The memorial is located across from the Smithfield Senior Center in Deerfield Park. Leading to the memorial is a walkway of approximately 8,000 bricks. Many of these bricks are engraved with the name and branch of service of a veteran. The walkway includes ten pedestals indicating the wars that our military veterans fought in, the number of participants and the number of those killed and wounded in action.. Across the back of the site, there are seven large natural stones (boulders) representing the six service branches they are honoring and the seventh is a memorial stone. There are granite benches, trees, and flagpoles holding the American flag, the State of R.I. flag and the MIA/POW flag. There is also a memorial to Smithfield Police Sgt. Norman G. Vezina, a veteran and Smithfield Police officer who died in the line of duty. 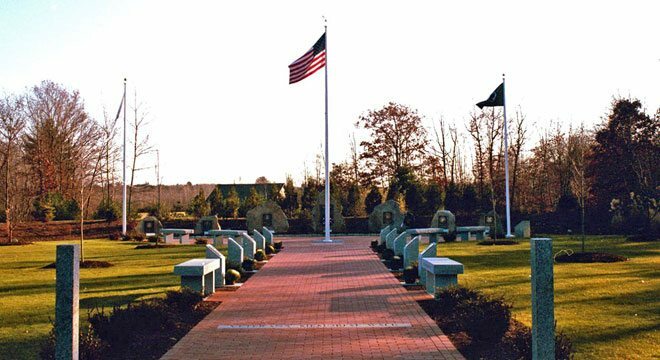 Anyone can purchase a memorial brick for the walkway (see photo at left) at the Smithfield Veterans’ Memorial to honor any veteran of United States service. All veterans are eligible. Bricks are $50 each and proceeds go toward the upkeep of the site. Application forms are available at the Smithfield Senior Center. Call 949-4590 for more information.